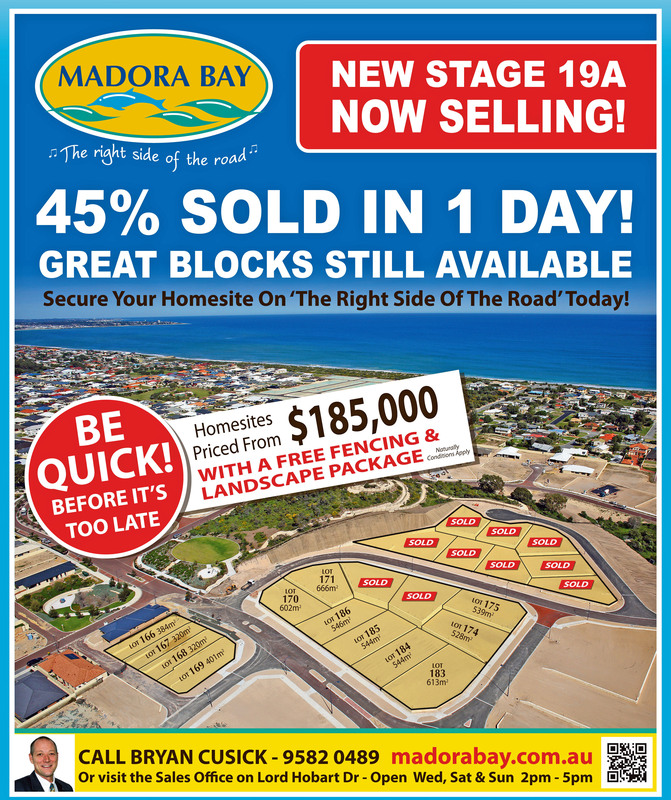 Madora Bay is currently selling 6 limited release blocks that are less than 200m to the beach. Stage 14 is the last release of land in New Madora that is so close to the water’s edge. These six home sites are between 359sqm and 360sqm in size, and each comes with a FREE fencing and landscaping package. They are perfect for those who enjoy the beachside lifestyle but don’t want a large block to maintain. Madora Bay is renowned as being the most livable suburb in Mandurah for its easy access to the city foreshore and the freeway to Perth. Its streets are whisper quiet as all of the services that you require are located just across the other side of the highway. A new Kindergarten to Year 12 private school has been planned just south of Madora Beach Road which will provide families with an excellent option for education. If you’d like to secure a beachside lot in Madora Bay, call Bryan Cusick on 0474 440 666 and ask about our generous early building incentives. It’s been well advertised that WA’s real estate market has been experiencing a flat period, however sales in the Mandurah / Murray Region have produced a mixed bag of results according to REIWA’s latest statistics. Overall the Mandurah / Murray Region recorded 0.0% growth over the last year. A slight dip for the quarter didn’t affect the area’s long term growth of 0.5% over 5 years. There has been a steady flow of buyers taking advantage of those properties that are priced realistically. If you’re interested in selling and would like to know the value of your home in todays market, call H&N Perry on 9535 1822. Overnight Campers Reap The Rewards! It was a cold couple of nights for some Madora Bay buyers who spent two nights camping at the Sales Office in anticipation of the new land release – Stage 19a. By Friday night there were seven parties who had set up camp. Spirits were high as the new ‘neighbours’ discussed the homesites they wanted to buy. Estate Manager, Bryan Cusick provided the eager buyers with piping hot pizza and the Sales Office remained open for use of the amenities. With the footy being a hot topic on the night, one buyer even brought down a TV so they could all watch the West Coast Eagles fly to victory. More people arrived at 5am and 7am ready for the official release at 9am on Saturday 12th September. Needless to say 45% of the new stage was eagerly snapped up on the first day. Stage 19a represents excellent value for money and there are still some great blocks available ranging in size from 320sqm to 666sqm. They all come with a FREE fencing and landscaping package, naturally conditions apply. Peel Region Values Continue To Rise! 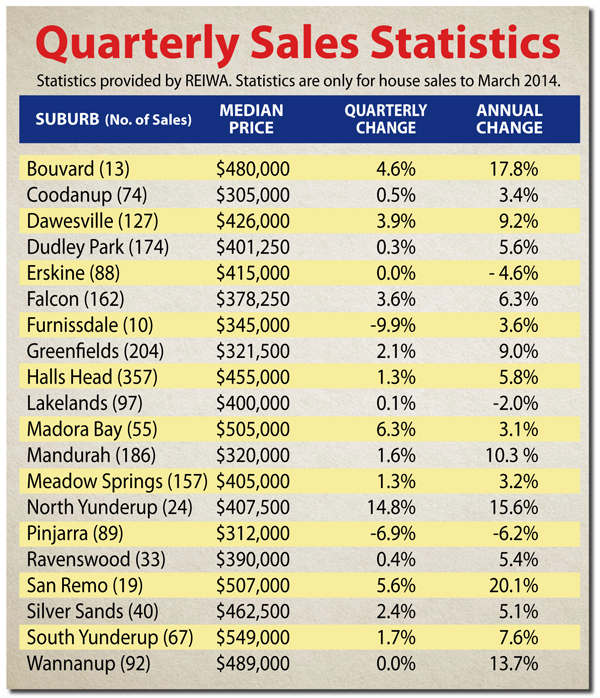 Home owners in the Peel Region have two very good reasons to be smiling this week. One is that the Reserve Bank have decided to keep interest rates on hold at a record 2.5% low for the ninth month in a row. This move offers great stability to home buyers and will assist in retaining confidence in the real estate market. 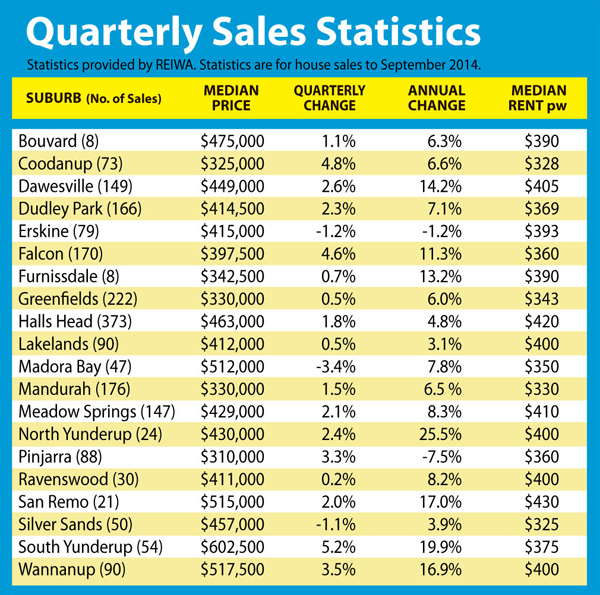 The other good news story is the release of REIWA’s quarterly sales statistics. Home owners can rejoice that in the first three months of this year, nearly all Peel Region suburbs with more than 30 sales continued to climb in value. Some buyers have been frightened by recent reports of housing unaffordability. This has been compounded by media reports of the state government reducing stamp duty concessions for first home buyers. H&N Perry would like to assure all buyers that although the Perth real estate market has become unobtainable for some, there is still a good range of affordable properties for sale in the Peel Region. Homesites that are only 500 metres from the beach, can be bought for as little as $135,000, just south of Mandurah at Florida Beach. This represents excellent value and a great opportunity for all buyers to make a solid investment in beachside land. We also have a range of affordable established homes for sale and encourage buyers not to delay in taking that all important first step on the property ladder. If you’re a home owner and would like to know how much your property is worth, call one of our experienced Sales Representatives on 9535 1822. H&N Perry specialise in the sale of residential and commercial properties throughout the Peel Region. We can help you achieve the best price for your property. New Beach Front Land Release! If you’ve been waiting for a beach front homesite at Madora Bay – now’s your chance to secure one! 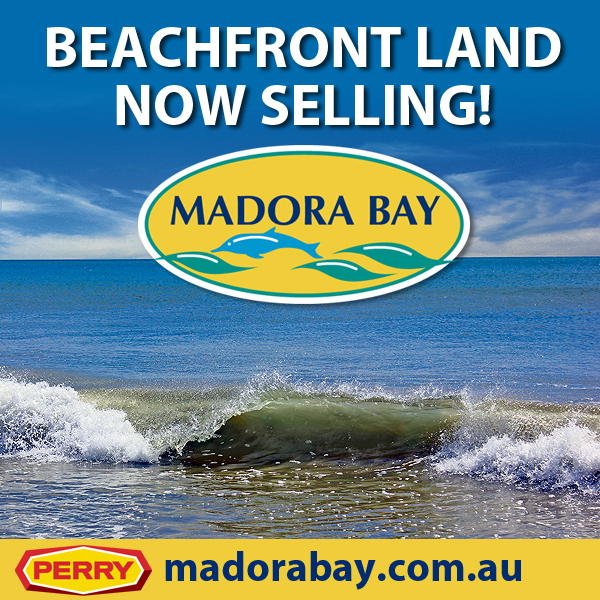 Madora Bay Partnership have just released two new exclusive lots overlooking the beautiful Madora Bay Beach. These two homesites are a generous size of 588m2 and 555m2 with the benefit of rear access which will allow you to build a home that takes advantage of the wide ocean view. The developers are also offering very generous early building incentives of $20,000 cash back plus front landscaping, naturally conditions apply. Priced from $495,000, the lots are level and fully serviced. Madora Bay is well known as the ‘right side of the road’ for many reasons. In 2012, the Australian Bureau of Statistics recognised the northern Mandurah suburb as home to the Peel Region’s highest income earners. It’s quiet neighbourhood streets and playgrounds offer families a safe place to raise children whilst still being close to amenities such as the shopping centre, private and public schools, Mandurah Surf Lifesaving Club, Mandurah Foreshore and the Marina. Madora Bay’s close proximity to the Kwinana Freeway entry also offers residents easy access to Perth city.